Instead of having guests sign a guestbook, I decided to make “postcards” for each guest to sign. After the reception, I incorporated these postcards into a wedding scrapbook. 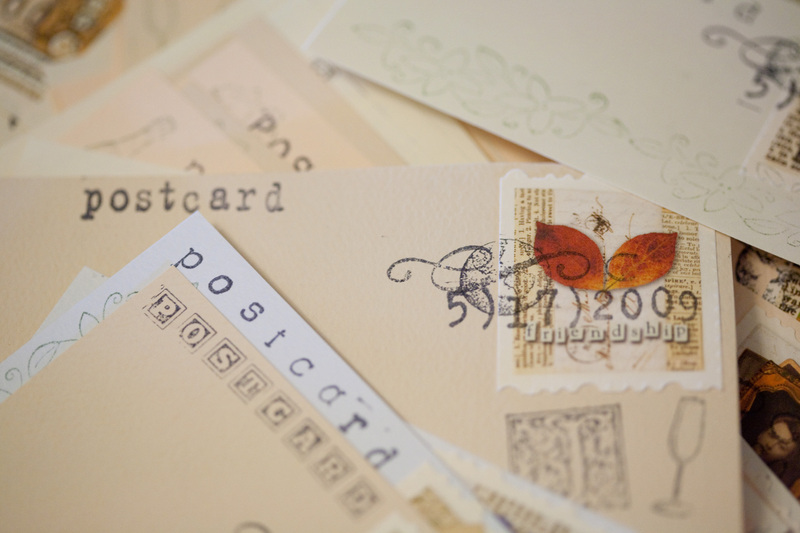 At first, I thought about buying postcards, but I couldn’t really find any that had the vintage look I wanted. Well, actually, there were lots of vintage postcards available through the web (and some of them were really beautiful! ), but they were collectors items–so pretty much not a realistic option (I mean, I can’t afford to pay $23.00 for ONE postcard!). So again, the solution came down to making these postcards myself. First I gathered my tools: various colors of thick cardstock, a great scrapbook paper I found that looks like a whole page of postal stamps, scissors with an edge that looks like the perforations used for postal stamps, rubber stamps, stamp pads in black and green, and lots of glue! I made various sizes of postcards–tiny ones for guests to just sign their names, and medium to large sized postcards for guests who want to write a bit of a message. Another benefit of the postcards was that multiple guests could sign at once, as you can see below. The photo on the left is from our vintage-themed engagement photo shoot (future post!). 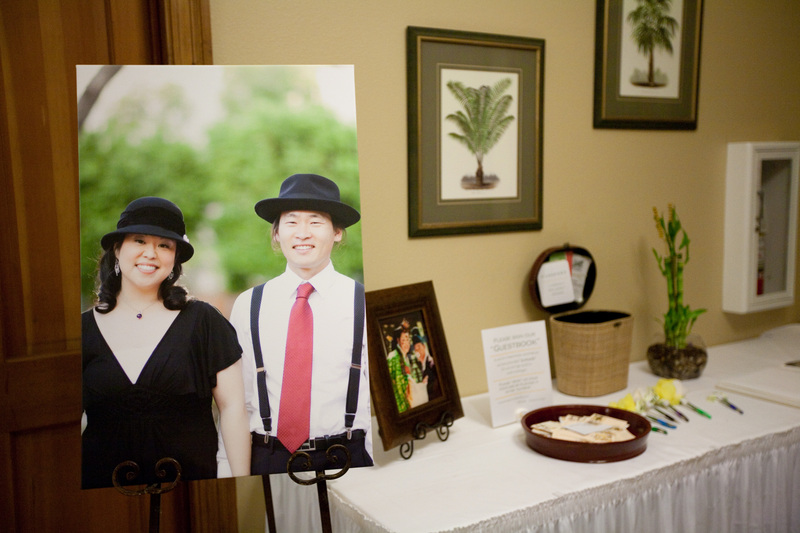 We also featured a photo from our traditional Korean wedding ceremony that took place a month earlier. The postcards were available in a shallow wooden bowl. Once the guests signed their postcards, they deposited them into the old-fashioned bag you see on the right (flea market find!). 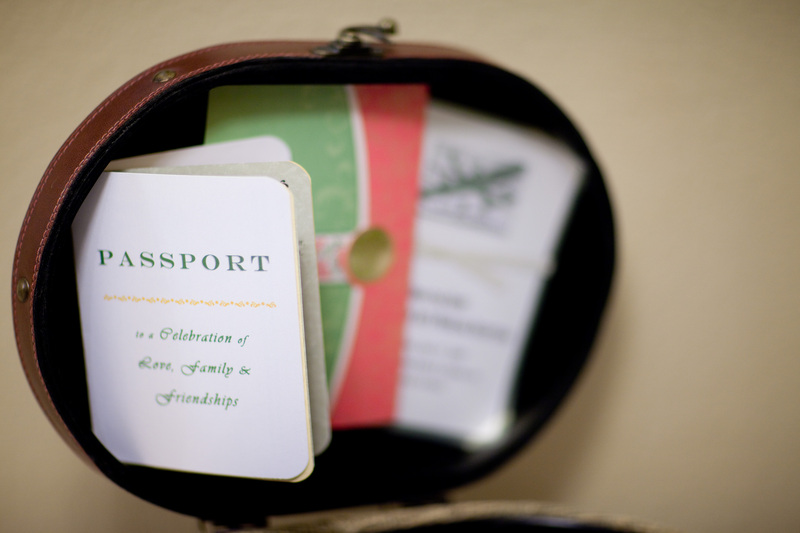 The inside lid of the bag was lined with one of my passport invitations, one of our Korean wedding invitations and our “Save the Date” card (which featured a vintage airplane). Afterwards, the postcards went into our travel-themed wedding scrapbook, which also included all the cards we received, as well as photos from our various travels over the years. I can’t tell you how many times I’ve pulled the scrapbook out to fondly visit memory lane! I am actually happy to read this weblog posts which carries lots of helpful information, thanks for providing such statistics. Do you mind if I quote a few of your posts as long as I provide credit and sources back to your website? My blog is in the exact same niche as yours and my visitors would genuinely benefit from a lot of the information you present here. Please let me know if this okay with you. Regards! Superb website you have here but I was wondering if you knew of any user discussion forums that cover the same topics discussed in this article? I’d really like to be a part of group where I can get feedback from other knowledgeable individuals that share the same interest. If you have any suggestions, please let me know. Bless you! Hi there, You have done a fantastic job. I’ll certainly digg it and in my view suggest to my friends. I’m sure they will be benefited from this website.